3 Lighting modes: including Read, Study, and Relax. 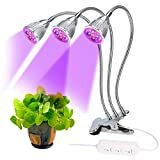 LED lights use very little power and resist getting hot. 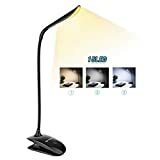 Portable and easy to transport: The space saving design gives you a high quality lamp that will fit easily in your suitcase, briefcase, or backpack. Dimensions are 10.6 x 2 x 2.6 inches. Folds for storage or travel. High capacity: The Battery capacity is 2000 MAH. After full recharge (4 hours of recharging) the battery can last up to 4 hours in lighting mode 1 (warm light - 3000K), up to 3.5 hours in lighting mode 2 (cool light - 6000K) and 2 hours in lighting mode 3 (natural light - 5000K) respectively. Three-pin plug UK Adapter. Dimmable & Memory Function: 5 Brightness Levels and 5 Color Modes are controlled by a touch sensitive panel. You can dim the light to find the perfect brightness level for your situation. Automatically resume the brightness setting of the previous use when restarted. 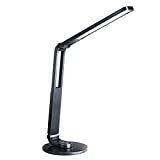 Highly Adjustable Swing Arm: The lamp head can be adjusted 160°up and down, and 120°swivel. 16.9+16.9" extendable long arm. There is always one lighting angle can meet your requirement. 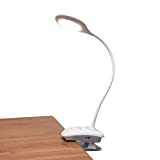 Portable Sturdy Clamp allows the lamp to be placed in a variety of positions steadily without consuming desk space. With modern looking and simple design, you can clamp on a table within 38mm thickness. Made of premium aircraft-grade aluminum-alloy. 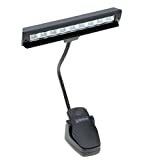 Bright & Eye-caring: Light source with 64 LEDs, provide 840LM light when it is at maximum setting. Non-Flickering Natural Light, Eye Protect. Wide Range Application: 50000-hour lifespan and 25% energy consumption as a incandescent bulb does. 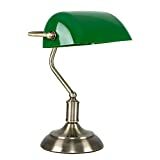 This multifunctional desk lamp is best for reading, painting, working. Stylish design make it also a decoration in Living Room, Bedroom, Office, Work Bench. 3-Level touch sensitive controlled dimming adjustable, night light, 60 minutes auto-off timer saves on electricity. 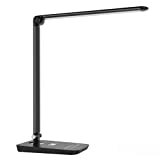 Adjustable arm and foldable design for easy storage and easy directing of light. 500lm in full brightness. 100-240V AC. 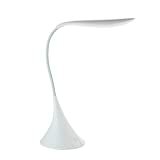 Compared to traditional incandescent light, this light brings the same level of brightness but consumes 75% less power. 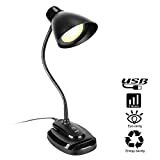 Energy saving lamp - LED table lamp with power consumption of only 4.2 Watt. With integrated LED bulbs - LED burn time: 20,000 hrs. 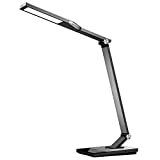 Directional light - good as spot lighting - adjustable arm for optimal light alignment. 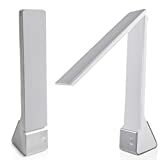 3 levels dimmable desk lamp: Smart touch control,you can touch the switch to turn on the table lights and adjust the brightness as you need.Color temperature is 2500K to 6000K. 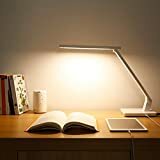 Eye care book lights: light is dimmable and 5W soft lighting,which protect your eyes when you are reading,working,studying. With standard wireless charger:Convenient to charge for your phone built-in qi receiver,such as Samsung galaxy s8 s7 s6 note5 note8 S6 edge S7 edge iphone8 8plus iphonex. Just put the phone on the lamp. 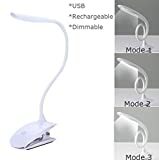 Connect USB cable and desk lamp,then connect the power supply to charge.Place the phone built-in qi receiver for charging.It will stop charging when your phone is full of power. 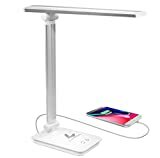 NOTE: the lamp will not come with adapter, please prepare one for it( 5V 2A), and your phone should support QI wireless charging or have a QI wireless charging receiver. Protect Eyes - Close to daylight illumination, diffusion panel emitting soft light without ghost, glare or flicker. Stepless Dimming - Memory of brightness, free to adjust and easy to keep personal setting. 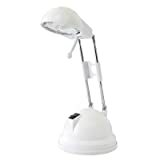 Highly Adjustable - 180°swivel lamp head, 42+42cm adjustable metal arm, rotatable body. Strong clamp supports up to 6cm tabletop. Longevity & Energy Saving - 50000 hours lifespan, 25% energy consumption as a incandescent bulb does. Note - To increase the usage life, please don't bend the arm to the opposite direction. 【360°Foldable & Covenient】 With a 360°lamp base, 225°rotatable lamp head and 80°adjustable help to save space when not use it as we can choose fold them. Meanwhile,various foladable angels support to choose the best angle, which is so convenient for our life. 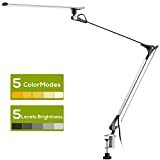 【35 Choices for Light Setting】7 brightness levels and 5 color modes (range from 3000K-6000K), perfect for any occasion(reading, study, relax, sleep),chose the best just based on your mood. 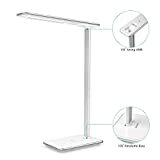 【Eye-protection & Health】 Adopts unique LED side-illuminating technology, LED table Lamp creates no flicker, no dizzy light, no shadow and soft light, which avoids eye fatigue caused by flickering light and harsh glare effectively. 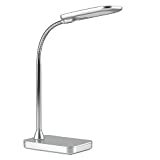 【Touch & Memory Function】Desk lights with Touch-sensitive and Memory Function will resume automatically the brightness setting of the previous. 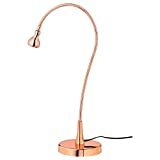 Built in usb charging port, you can charge them by cellphone or computer or something while working, reading, studying. 【Brighter and Longer Lifespan】 Consumes 75% less energy than traditional incandescent light for the same level of brightness. Adopted 80pcs LEDs, the luminous flux can be up to 600lm. Up to 50,000 hours lifespan under normal use. 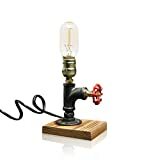 Last 40 times longer than a typical incandescent light. 9 LEDs provides strong light, suitable for lighting music score when user playing piano or other musical instrument. 2 power supply ways: putting in battery or connecting USB cable. 360-degree bendable to fit various condition. Clip lamp base firmly fixed the lamp, saving space and keeping the lamp safe. Protective patch on the clip mouth can effectively avoid abrasion on things like book. 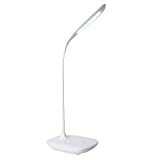 Switch on the top of the lamp can adjust light levels to meet your different requirements. High capacity and long-life battery & USB Rechargeable: With built-in 2200mAh rechargeable battery (lasting at least 4h for high brightness), can either be plugged in or used with battery. A wider lighting area & eye-protect light: Special O-ring light design, including 20 LED lights (three levels brightness: low, medium, and high) to efficiently light the desired area. Non-flickering LEDs provide a warm white light (4000K) that is easy on your eyes for bedside reading. 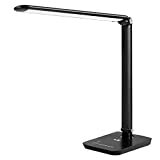 With an additional night light: There is an additional 8 leds night light for night book reading. 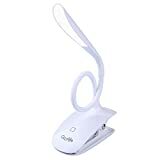 Compact & customizable led clip on desk lamp: With up to 2.3 inch width clip, 360-degree flexibility, can be used in different position. Its 11.8 inch (30 centimeter) neck gives you plenty of height for any activity. And with its compact size, take the lamp anywhere you need the light. Wide range of applications: suitable for reading and studying, camping, or when using cupboards, computers, pianos, music stands, outdoor tents, desks, or tables and much more. Energy-Efficient LED Technology: Achieve the same level of illumination while saving up to 75 precent of energy compared to the traditional incandescent light bulbs. k allows you to adjust to any desired angle. 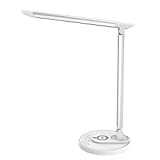 And thanks to the built-in base stabilizer, the reading lamp base will stay sturdy when you adjusting its angle. ABS material: Using the ABS material, which can polish the light body and a greater heat sink effect, can length the service life of this grow lamp,lower heat and lower power consumption, high luminous efficiency and long service life. TARGETED WAVELENGTHS: Grow Light gives off targeted wavelengths(red: 630~660nm blue:450~470nm) light ray to help accelerate the growth of indoor plants, foliage plants, flowering plants, succulent plants, potted plants, promoting leaves and flowers blooming. USB Output: Equipped with 5V 1A USB output port, you can use it to charge your mobile device, like smartphone, tablet, or other USB electronics. 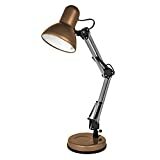 Based on the design classic, this desk lamp has an articulated double arm and swivel head, a round base and a clamp. Available in black or white. 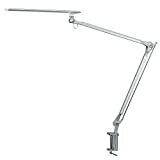 Fantastic light coverage and range thanks to an articulated double arm and swivel head. 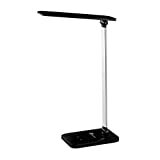 Great stability provided by the interchangeable desk clamp or round weighted base. Compatible with any E27 bulb. Energy rating A when used with an LED E27 Bulb. Bulb not supplied. CE rated. 3 year warranty. 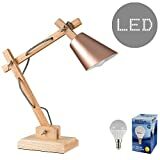 EYE PROTECTING DESIGN: This reading light is made of 14 high quality LED beads, non-flickering, high efficiency and super bright. Soft light effect is specially designed for eye protection. CLIP DESK LAMP DESIGN: One light, two purpose. 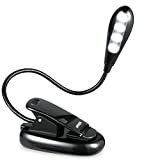 Could be used as desk lamp, also could work as a portable multi-purpose clip light. Well designed stainless steel clip with protection rubber pad, won't leave damage on surfaces of clamped items, can be easily clamped on table, headboard, somewhere in boat or tent, etc. 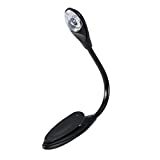 Flexible Gooseneck Design: Bendable gooseneck, elegant and convenient, combine with the clip function, it brings entire position illumination and takes care wherever you want to look at. TOUCH SENSITIVE DESIGN: 3-Level extreme sensitive touch control, adjust the brightness with a light touch. Material: Plastic. Size: 25x3x1.5cm / 9.8x1.2x0.6inch. Replaceablility: Just replace with two CR1220 batteries. Lightweight and Portable to put in your pocket and you can take it anywhere you want to go. 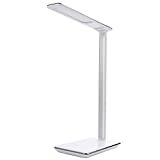 LED Book Light provides a clear natural and Non flickering light protect your eyes. Idea for reading book or laptop in the dark. 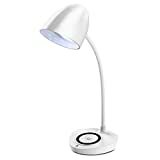 【Eye-Friendly】:LENDOO table lamp creates no glare,shadow and blue light,which is pleasant on eyes and avoids eye fatigue,ideal for reading, studying in the bedroom, study room or the office. 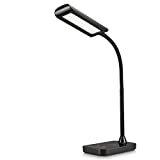 【5 Brightness Levels and 3 Lighting Modes】:This desk lamp is designed with Touch Sensitive Control and 5 brightness levels and 3 color temperature models can be chosen on this study light to best suit all of activities. 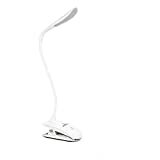 【Energy Efficient and Long Lifespan】:LED desk lamp makes use of about 1/5th of the total energy that a incandescent lamps consumes and are the most eco-friendly ,in addition,LEDs have a life of about 50,000 hours. 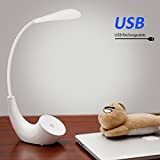 【Adjustable Rechargeable Reading Lamp】:It can be charged with a USB cable and charge your phone at the same time .Since adjustable desk lamp is engineered for both the task and ambient lighting, the height settings can be varied under your control to have the light either diffused or focused. 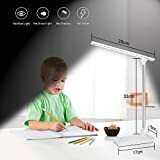 [Advanced Eye-Protection Technology]:Advanced light guide panel side-emitting technology to provide a soft and extremely stable non flickering LED light and mulitifunctionnal dimming levels of brightness for work, study, reading, or relaxing. Led light has a nature of low power consumption which leads to significant energy savings and 85% less energy than incandescent lamps. [Skid Resistance Setting]:Large area of the bottom of the slide make light more stable. [Convenient USB Charging]: Recharge your devices via the built-in 5V/2A USB output; keep your smartphone or tablet within reach while charging. 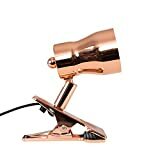 [Rotatable Lamp Head and Arm]:Adjustable head tilts up to 120° and arm tilts up to 90°, which allows you to easily adjust the light to the perfect angle for your convenience. [Auto Timer Function]: 1 hour and 2 hours auto timer setting, the lamp will turn itself off, a very useful feature for those who sometimes fall asleep while reading, particularly in bed.